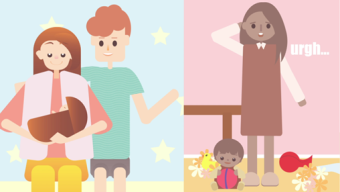 Dr Eleanor Jupp, Lecturer in Social Policy in the Faculty of Social Sciences, worked with the University's Digital Media Hub to produce an animation based on her interviews with mothers in Medway who were facing the closure of their local Children's Centres. Sure Start Children's Centres were set up by the Labour government (1997-2010) to provide neighbourhood spaces for children under five and their parents, providing drop-in play and other services such as health, education, feeding support and particular activities with children. They were designed to be in 'pram-pushing distance' so that parents could easily access them, especially mothers in the early days of looking after a baby. Since 2010, nearly a third of all centres – estimated at 1,000 – have shut due to the pressures on local authority budgets presented by austerity, as well as a loss of political support under the Coalition and now Conservative governments. Eleanor Jupp has been researching Children's Centre closures in two local authority areas, looking at the political decision-making surrounding closures, and also how communities respond. In Medway, Kent, she interviewed mothers who came forward when centres were under threat of closure in 2017 to tell their 'stories' about the importance of the centres in their lives. These stories were concerned with the often hidden aspects of motherhood – isolation, loneliness, and mental and physical health. The animation, created by Kent BA Digital Arts students Eleana Gabriel and Yee Hui Wong, makes some of these hidden stories visible to a wider audience and shows the importance of the centres, especially in supporting mothers, at a time when they are under threat nationally. The research was funded by the Faculty of Social Sciences. Watch the animation on YouTube.